Enjoy an extra 25% off all sale items on Shopbop, now until the 1st! Stock up on the best wardrobe basics, like these coated skinnies (or this gray pair! ), this striped silk blouse or this fabulous Ferragamo bag. On the not-so-basic end, we’ve got this flirty spring frock, these studded Aquazzura stunners, and these statement earrings by Jenny Packham! A few other things to peruse: this glam bikini for your next beach trip, this sequin top I wish I had for NYE, and this perfectly perfect oversized shawl coat. Enter code CHEERS2015 at checkout! Anthropologie is offering an additional 25% off newly marked down items, to include clothing, accessories, home stuff, and so much more!! For the home, I’m loving these gilded calf hair coasters, this set of Nordic elk measuring cups and this hand-knotted rug. If you’re on the hunt for party wear or something to don on date night, check out this feathered boucle top, this gorgeous brocade sheath or this feathered + embellished blouse. So pretty! Just enter code INAFLURRY at checkout. Take an additional 50% off all sale items on Piperlime.com until 2am CST tonight! Don’t miss the chance to pick up party favorites like this leopard-print dress, this sparkly Rebecca Taylor blouse and this embellished DVF coat. Just enter code CHIC50 at checkout to save. Now’s the time to head back over to One King’s Lane, especially if you’re hoping to get the left bank look. Parisian chic decor and furniture at its best, like this luxe concord rug (also love this one and this one), this 19th Century loveseat, and this quatrefoil gold tray. Also, how cute are these little souvenir boxes? While you’re on the site, stop by the Hermes sale too if you’re looking to drool over some gorgeous bags and other accessories (I’ll take this). And with that, I’m off to Utah for the rest of the week/weekend! Follow along with my adventures on my Instagram – can’t wait for a winter wonderland! Love the purse, shoes, and jewels. The shades are on my scheduled post for Friday. Great picks! love these soft colors and 14 is such a stunner. Great picks! I’m ready for spring! Love your picks here! OH MY GOD… I think I absolutely NEED that IRO jacket!! Great picks! I am headed to South America soon and this round-up is perfect for the weather there! I love the tote choice! I always like the softness and elegance of cream paired with light blue! 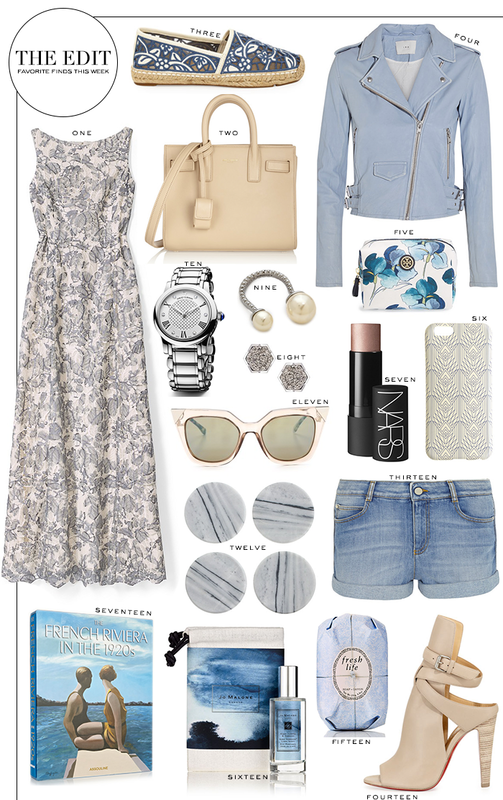 Totally into pastel blue right now! So pretty..and #14 is fabulous! !